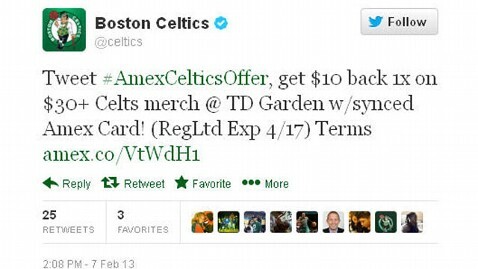 Twitter and American Express have expanded their Amex Sync partnership to include a purchase-by-hashtag feature. The new service will allow users to buy products promoted on Twitter by tweeting the appropriate hashtag. 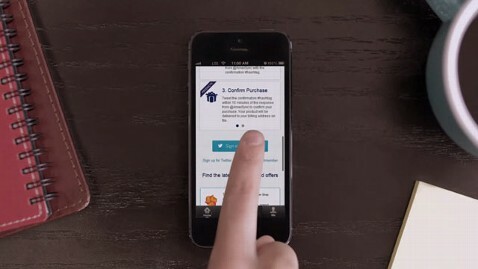 A user can make purchases by synchronizing an eligible American Express credit card with his or her Twitter account at sync.americanexpress.com/twitter. When the user sees a product or offer they like, they can tweet out the corresponding hashtag and @AmexSync will respond with a confirmation hashtag. The user simply needs to retweet the confirmation hashtag within 15 minutes to confirm and complete the order. American Express kicked off the service Monday by promoting a #BuyAmexGiftCard25 hashtag that offers a $25 American Express gift card for $15. The company says that all products purchased with Amex Sync on Twitter will be shipped via free 2-day shipping. Amex Sync and Twitter will offer American Express Gift Cards, as well as "specially-priced" products from Amazon, Sony, Urban Zen and Xbox 360. American Express has said "the full list of product #hashtags will be released and highlighted as 'favorites' on the @AmericanExpress Twitter page" beginning Feb. 13 at noon ET. ABC News asked Bradley Minor of American Express how security is handled when one makes purchases on an online social network. "Safety and security is core to our brand and to our new social commerce initiatives," Minor answered. "No Cardmember account information is shared with Twitter. The process of syncing a Card is conducted on secure American Express servers." Minor did say the service requires that the user have a public Twitter account. Both the promotional hashtag requesting the order and the confirmation hashtag need to be tweeted publicly. The Amex Sync program was launched last March, starting with promotional discount or coupon offers across social network platforms. After the user chooses and shares a promotion online, the Card Sync technology is used to apply an automatic credit to the cardholder's American Express account when they swipe their card at the store, doing away with the need to print out vouchers or coupons. So far, American Express has partnered with Twitter, Facebook, and Foursquare for Amex Sync, but the new purchase-by-hashtag service with Twitter is the company's first try at actual social network purchasing. "We wanted to bring [purchasing] to Twitter first," Minor said. "This is the most dramatic manifestation of what our tech can do because it's all happening in 140 characters or less and showcased in a hashtag. That said, it would be possible to transfer the underlying capability to other platforms."